Be the first to share your favorite memory, photo or story of T.. This memorial page is dedicated for family, friends and future generations to celebrate the life of their loved one. Sargent T. J. Crumby was born August 25, 1947 in Tryann, Arkansas to Nathan and Velma Baker Crumby. 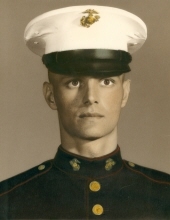 He served in the United States Marine Corp from December 21, 1967 to December 20, 1973. Later, T. J. was united in marriage to Sharon Kaye Ross on July 25, 1983. He worked for Sante Fe Railroad, then went into business with his brother Edward Crumby operating an auto salvage, dump truck, and towing business. When T. J. wasn’t working, he enjoyed fishing, boating, and camping. T. J. was preceded in death by his parents, son Ronald Jr., brothers, Edward, Nathan, Lloyd, Curtis, sister Fay, great-grandson Jacob, and his father-in-law Nolan Ross. He is survived by his wife Sharon of the home, two daughters, TraJae and Lisa, both of Shawnee, KS., son Michael of Drexel, MO., four sisters, Helen, Mary, Shirley (Harold), and Gloria, three brothers, Jerry, Terry, and Gary, mother-in-law Thelma Ross, grandchildren, Randy (Kristin), Tesla (Mike), Valerie (Chris), Ronald III (Britlee), Paul, Devin, Jasmine, Aimee, Adriana, and Jessy, 12 great-grandchildren, Randy, Brody, Emilliah, Mikiah, Ady, Ryker, Hayvn, Krew, Kannon, Emrie, Ricky, Elocin, along with many nieces, nephews, extended family members and a host of friends. To send flowers or a remembrance gift to the family of T. J. Crumby, please visit our Tribute Store. "Email Address" would like to share the life celebration of T. J. Crumby. Click on the "link" to go to share a favorite memory or leave a condolence message for the family.